Interview with Fr. Ibrahim published in La Stampa. "It is Christ who gives us the strength and the generosity of heart to listen and help this wounded humanity." The day after an explosion at the Coptic Orthodox cathedral in Cairo killed 25 people, mostly women and children, Pope Francis called the head of the Church to offer prayer, and to say they are united the blood of their martyrs. Pope Francis has recognized the martyrdom of Father Stanley Rother of the Archdiocese of Oklahoma City, making him the first martyr born in the United States. On the Solemnity of Christ the King, Pope Francis celebrated Mass in St Peter Square concluding the Holy Year of Mercy. 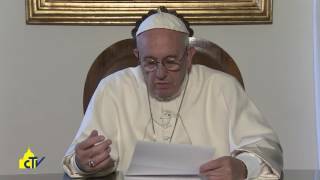 Pope Francis sent this video message to the General Assembly of the United States Conference of Bishops in Baltimore, Maryland (November 14-17, 2016), a year after his visit to the US. Forty Junior High kids discover friendship in the mountains of Lyons, Colorado, for the vacation of the Knights of Denver. For the first time, ten of them were from California. Pope Francis visited the earthquake-hit towns of central Italy in a surprise journey and prayed with the residents of Amatrice on the feast day of his namesake. Pope Francis: "A call to learn every day the challenging art of communion, to acquire a culture of encounter, purifying the conscience of every temptation to violence and stubbornness"
“We have many rugs and furnishings in the monastery that we can sell, before we have to sell … ourselves!” The Catholic parish of Saint Francis in Aleppo took all means necessary to relieve the financial debt of families in need. "Our only criterion for action is gratuitous love"
Holy Mass and Canonization of Blessed Mother Teresa of Calcutta. "For Mother Teresa, mercy was the “salt” which gave flavour to her work..."
On September 4, 2016, Mother Teresa of Calcutta will be proclaimed a saint. We talked about her life with Fr. Brian Kolodiejchiuk, the postulator of her cause for canonization, who spoke of the power of the fruit she bore and the intimacy of her faith. In 2012, the Movement was going through difficult times. Dario Di Vico interviewed Fr. Julián Carrón on Communion and Liberation's political engagement and corruption accusations. Cardinal Pietro Parolin conveyed His Holiness Pope Francis' message to the thirty-seventh edition of the Rimini Meeting for Friendship Amongst Peoples. Pope Francis on Monday expressed his hope women enslaved to the “arrogance of the powerful” will be allowed to have a life of “peace, justice, and love.” The Holy Father was speaking during his Angelus address for the Solemnity of the Assumption of Mary. Here is what is happening in the civilian drama these days, in the words of Father Ibrahim, pastor of Aleppo, reached by telephone by Luca Collodi on August 9, 2016. "The desire for peace always wins over the other desire—the desire of war." This article follows Pope Francis as he visited the largest concentration camp in Europe. THE POPE ARRIVED IN POLAND! Accompanied on board the plane by a Pontifical Delegation and about 70 members of the press, Pope Francis begins his five-day visit to attend the World Youth Day celebrations taking place in of Krakow. We publish his speech given at Wawel Castle. To coincide with the feast of Mary Magdalene instituted by Pope Francis on June 3, 2016, Cardinal Robert Sarah has written an essay for the Vatican newspaper L’Osservatore Romano.